Originally a New York City resident, he started Djing in early 1993. He moved out to Chicago in 1996 and began hosting alternating weeks of the Wednsday Night Rap Show on WHPK. Starting in the fall of 1998, DJ Natural and Dan hosted the Wednsday night show every week. The show became a meeting point for many in Chicago's underground scene, who gravitated towards the show's strong selection of new and old hip hop as well as the ill freestyle sessions. DJ Natural and Dan's tenure on WHPK ended in the fall of 2000. Look for Natural's beats and cuts on upcoming solo releases from Qwel, Qwazaar, and Denizen Kane, as well as the group's next album, to be released in the fall of 2001. Dennis Sangmin Kim was born in 1978 in Fairfax, VA to immigrant Korean parents. He plans to die on May Day, 2078, having outlived capitalizm, master p, and the curious habit of calling both our seeds and our women "shorty." He is currently in the process of getting an edumacation, working a series of demeaning retail jobs, and explaining to his mother that he and jesus aren't tight anymore. Dennis believes that tweaking attitudes are no substitute for structural change, but that material progress without spiritual awakening is a hollow victory. He also believes that no one has ever looked good in powder blue. When at a loss for words he says, "peace." When high he says, "it's all one, baby!" No one knows what he says when he's lonely. The member of Typical Cats with the longest tenure in Chicago hip hop, Qwazaar first gained a reputation for rhyming at Dunbar High School in the early 90s. He is a member of the group Outer Limits, who will be dropping a second LP in the spring of 2001. 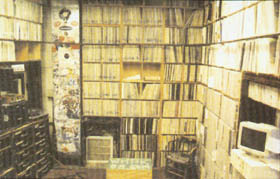 Qwazaar was the most requested mc on WHPK, a status he earned though his music and his classic appearances on the station. Check for Qwazaar's solo album being put out by Frontline in Chicago. He's not really that angry. Long-time Chicago graffiti artist, Qwel first emerged in the scene at Navy Pier ciphers and eventually though crews Nacrobats and Scam Artists. Known for his radio appearances on WHPK and WNUR, his performances at the All City and Chicago Blaze Battles, as well as his verses on other albums. Look for him on upcoming releases including White On White Crime, the Molemen compilation, and the next Eddie Ill and D.L. mixtape. Dan hails from Greenwich Village, New York City, and moved to Chicago in 1996. Along with DJ Natural, he cohosted the Wednesday Night Rap Show on WHPK where he immediately became one of the best looking members of Chicago's hip hop scene. His contributions to the Typical Cats album include production assistance, the selection and arrangement of the choruses and a good deal of ghostwriting--so don't ask him or his friend Jerobi what they did. Check for Dan's upcoming work all up in your mouf. Typical Cats is: Natural, denizen kane, Qwazaar, Qwel, and Kid Knish. Rymes by Qwel, denizen kane, and Qwazaar. Beats and cuts by Natural. Essential spice and marination by Kid Knish. Track 9 beat by Meatyogre. Track 12 coproduced by Kid Knish. Guitar (1, 14) by denizen. Melismatic vocalisms (1, 11) courtesy of emily chang. Recorded and engineered by Justus Roe and Jeff Kuglich at the Galapagos4 Island Resort Retreat Recording Recreation Center, Chicago IL. Mixed by Justus Roe and Jeff Kuglich at Rax Trax Studios, Chicago IL. Mastered by Colin Olan at Splintergroup, Chicago IL. Executive Producer: Jeff Kuglich for Galapagos4. Graphics and design by Josh Grotto for Galapagos4. Photography by Michael C. Shea.